How do I add a new CE course to My Account? How do I remove a duplicate CE course from My Account? Can more than one person use the courses? No. The courses are intended for individual use, and can only be reported for one users Continuing Education requirements. I understand that auto-reporting is available for my CE hours. How does that work? Once you have completed the course and passed the associated quiz, use the Action dropdown button next the completed course and select Report hours to GBCI/AIA automatically. You will need to have your GBCI and/or AIA member numbers ready. The GBCI member number is 8 digits long, and can be found in your USGBC account, under Credentials Overview. The AIA number is 10 digits long, begins with a 3, and can be found in your AIA account. Do your products count towards my AIA continuing education? Our courses support AIA continuing education requirements, and GBES is an official AIA CES Provider. Our CE courses are all approved by AIA, and certificates are available for download. For your convenience, GBES will also report the hours to AIA on your behalf. Simply use the Action dropdown button next the course once you’ve passed the quiz. Select Report hours to GBCI/AIA automatically. 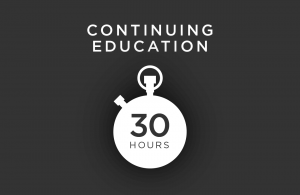 *LEED exam prep courses (webinars) also count towards AIA continuing education: The Green Associate set of courses is worth 8 hours/LUs, the BD+C is 7 hours/LUs, the O&M and the ID&C are 5 hours/LUs. I don’t have an AIA number to report. What do I do? The AIA number is only for members of the American Institute of Architects (AIA). If you are not a member of AIA, you do not need to report anything to them, and can leave all AIA fields blank in your GBES account. 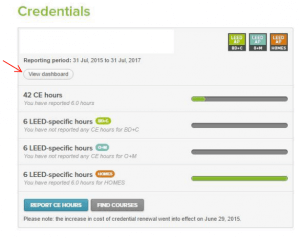 How do I manually report my CE hours to USGBC? 1. 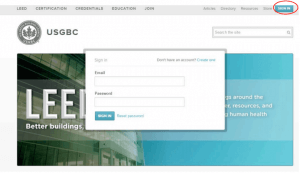 Go to www.usgbc.org and Sign In to your account. 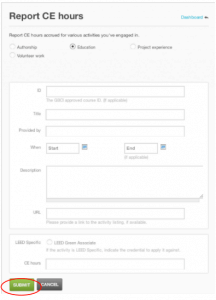 How do I report general hours as LEED specific in my USGBC Account? 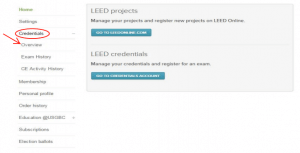 How do I correct LEED specific credits in my USGBC account? 2.Click on “Credentials” and select “Overview”. 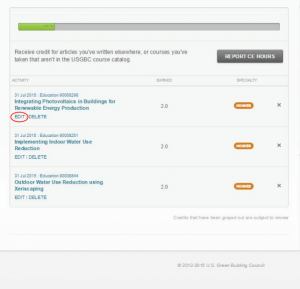 4.On the next screen, click “edit” under the CE Course name you would like to update. 5.Now you can select which AP Specialty you would like this course to the applied to. I purchased the Unlimited Lifetime CE Access package. How do I add these products to my account? 4.The courses you select will now be available in yours GBES account to watch. How do I report WELL specific hours to IWBI directly? Can I download my CE courses as audio files and listen to them in my car? Yes. When logged into your account, pressing the ‘Action’ button and selecting ‘Download MP3 for audio only’ will open a player in a new window. You must press the down arrow icon to start the download. Please note that this functionality is not available in the Safari browser. IT is recommended to use Chrome or this feature.